The factory 2009-2011 Nissan GT-R brake rotors are massive. 380 mm front and rear. The reason that Nissan went with such a huge rotor was in part due to the need to be able to absorb massive amounts of heat energy from trying to slow a 3800 lb , 485 horsepower car. On the street, or light track use, the OEM rotors work out ok . 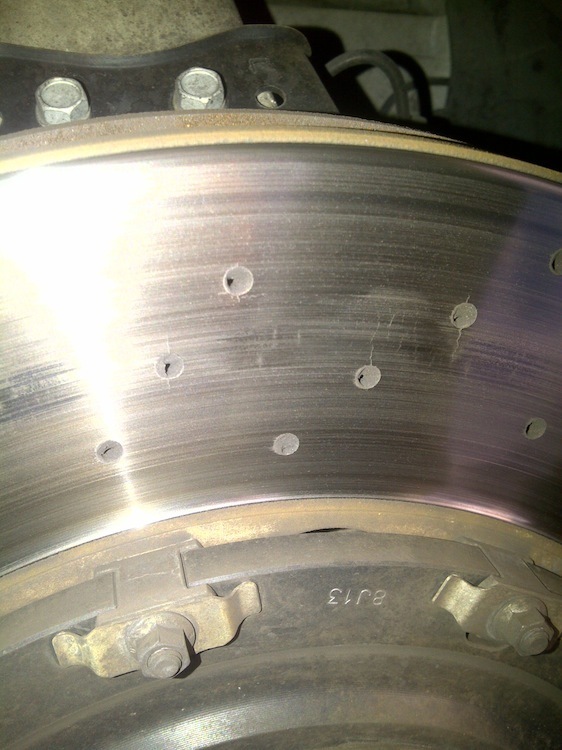 However, get above that "light track use", and you run the risk of cracking and warping the factory rotors, and factory brake pads. This example here is not isolated. When this happens to most owners, the best upgrade is the STILLEN/AP Racing curved vane rotors in either slotted, or j-hook styles. The STILLEN/AP curved vane rotors are made from a much more durable material than the factory cross drilled rotors, and most owners see three to five times as long a life under heavy track use as a factory rotor. The picture above was taken from a post on NAGTROC. An owner observed the minor cracks, and took the car to a Nissan dealer. The dealer quoted him $9451 to replace all four rotors, pads, bleed and flush the system. The cracking rotors are fairly normal, unfortunately. This is one of those issues that I have been talking about since before this car was released to the US market. The R35 GTR is a big heavy car, and even with a huge brake rotor, it is a OEM product made for the more mass market than the higher performance end of the market. 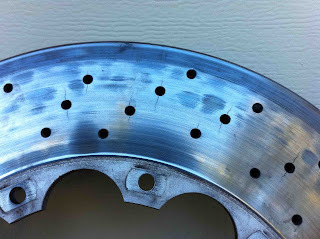 The proven track and hard street race use rotor for the Nissan GT-R is the STILLEN/AP racing curved vane rotor. We sell them as a set for $1198.64 each , or $2397.28 for the four, including hardware. At the shop here we charge $99 per axle for the rotor and pad replacement. $198 for all 4. The best fluid we have is the AP608 and it runs $28.99 per bottle x3 for the system=$86.97. Brake pads. Ferodo DS2500 fronts are $401.31 and rears are $206.63. We can even add some stainless steel lines at $314.79 +$198 to install(bleed and flush). Total installed would be $3802.98 here at STILLEN. That is four, better than stock rotors. Better than stock pads. Better than stock fluid, and new stainless steel brake lines. For less than the 9k, you could have it shipped to us, we could do it, and ship it back. However if you want the ultimate brake upgrade for a GT-R, we have the CCM, carbon ceramic matrix brake rotors at $15,990. 38 lbs lighter than stock, and they should last the life of the car.